Although not a particularly clear picture, it does give some idea of the recurrence of my breast cancer in the soft tissue surrounding the clavicle. Although this entry is about the reason for my absence on these pages, it is also a platform for me to give thanks to those that have taken the time to contact me voicing concern at my absence. I am amazed that so many have emailed me personally, enquiring after my well being. I am indebted to you for the gift of your friendship. Please let me say that you have become more like 'family' than my own. To be perfectly honest, I am not really sure why it has taken me so long to organise myself to do what I love most; that is to blog. We did manage to do a road trip to Victoria for which I am very grateful. I succeeded in spending time with each of my three children and their families.﻿ On our return, I decided to act on my concerns, making an urgent appointment to see my doctor. He agreed that immediate action was necessary. The lesion on my clavicle, growing rapidly and causing the area surrounding it to become very inflamed, required treatment. My appointment with my Radiation Oncologist did not go particularly well. I asked him if what I was looking at could have been caused by the radiation given to treat my cancer. He avoided my eyes and denied that was the reason, although his silence told me all I needed to know. I then saw my Medical Oncologist who, once again, proved himself to be 'my kind' of doctor. 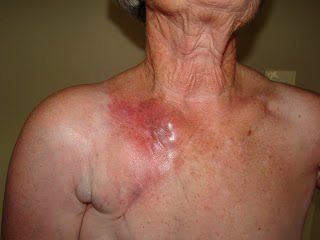 He explained that what he was looking at appeared to be breast cancer recurrence in the soft tissue. He said it is not uncommon, and, although it is not usually fatal, complications can kill. Chemotherapy is not given routinely as it is not effective. Dr Van has requested another CT scan prior to seeing him on 19 May. I must admit to being slightly concerned about radiation given the number of scans undertaken over the past 5 years. My last one was in January. Tonight I decided to seek information on possible cause and treatment of cancer recurrence in the soft tissue. I was not surprised to find that on one of the reliable Cancer Council websites, radiation given to treat breast cancer has shown to be a possible cause of recurrence in soft tissue. Naturally, the risks are greater the higher the doses of radiation given, and I was given what was considered to be the highest [safe] dose.